BJ and the Bear Gift Set- I want to own this so I can prove to myself that this TV show really happened because it so feels like a fever dream to me. Space:1999 Zython- What is it? It's an alien for the Space:1999 series that didn't appear on the show. It only got produced in tiny numbers in Germany. This one hurts, I want it but i'm just not flush with the cash. Ach, if that Zython ended a week later, it would be mine. Great sleestak, I think most of us would like one. If it were me I'd go for that Zython. I'd dig deep and see if I had doubles of something to list in case I won. I haven't found too much on ebay recently but eventually I'll find a grail to go full-tilt on. 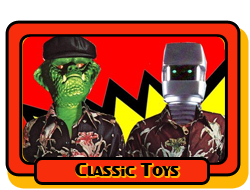 Is the Sleestak on the new Mego Gorn body or the EMCE body? looks like it. Don't know why but that truck from BJ and the Bear reminds me of Optimus Prime. Oh man I have one of the Space 1999 Zython loose for some reason. Kinda wanna see what he goes for now. I would have fun putting that Zython in my mother's Christmas decorations and see if she'd notice the strange new Shepherd. That flippin' alien; Zython is brilliant!… would look good next to Devilman, Gori, or an Electric Ape too! Some wild items this week! Regarding BJ and The Bear, it’s cool to see something from that series. I say that because, though it was very popular and a series kids liked, there has little merchandise. Man, I love that Zython so much, but not $900 much, wow!